Need something sharp to wear at night in the Sumer, why not consider this mens black leisure suit with short sleeves by Fortino. There is simply no reason not to look your best when you can dress to impress. 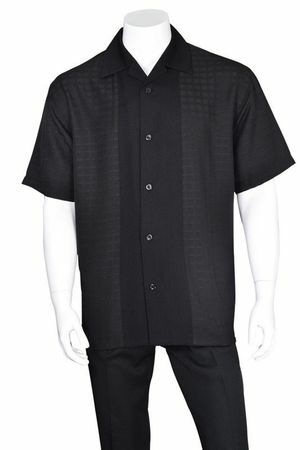 This black leisure suit with short sleeves has a cool and comfortable sense of style with it's open collar shirt with the checker panel pattern. The pleated pants on this black leisure suit with short sleeves only make the whole look complete. Made of micro poly.